A Missing Piece. The sequence of Sunday gospels does leave out vv. 35-41. The text from the 18th Sunday centers around Jesus challenging the people’s motivation for coming to Jesus. He tells them they only came to see more signs, eat their fill, but not really “work” for the bread that is eternal. The people not only do not understand Jesus’ point, but become bogged down in “what do I have to do to get it” as though they could accomplish this on their own talents and perseverance. Jesus response is that all one need do is believe – and the conversation returns to “show us another sign” and they up the ante – “and make it better than the one Moses did in the desert.” Dodd notes that “The ‘signs’ which the people expect from the Messiah are mere miracles; yet when they see a miracle they fail to see the ‘sign’; for to the evangelist a σημεῖον is not, in essence, a miraculous act, but a significant act, one which, for the seeing eye and the understanding mind, symbolizes eternal realities.” It is at this juncture that returns to the theme of “bread from heaven” only not the one, like the manna in the desert that will spoil, but one that last forever. 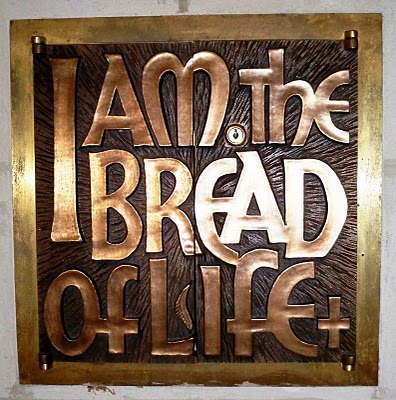 This entry was posted in Scripture and tagged bread of life, John 6:41-51 by Friar Musings. Bookmark the permalink.